U.S. PIRG delivers petitions to Microsoft. Photo by Ricky Osborne. How does such a popular, bipartisan idea — which enjoyed support from consumer groups including WashPIRG, environmental and waste groups and small repair businesses — get blocked from getting a floor vote? According to State Rep. Jeff Morris, Microsoft played a leading role. Across the country, large manufacturers like Microsoft and Apple tend to do much of their public opposition to Right to Repair through trade associations. Microsoft is among the manufacturers represented by trade groups like CompTIA, Consumer Technology Association, Information Technology Industry Council and the Entertainment Software Association, which are all active opponents to Right to Repair reforms. These trade associations can mask the role of an individual company, but are one of the key ways the opposition works to defeat pro-consumer Right to Repair legislation. But the behind-the-scenes targeting of Right to Repair by Microsoft seemed to play a more significant role in the bill’s demise. 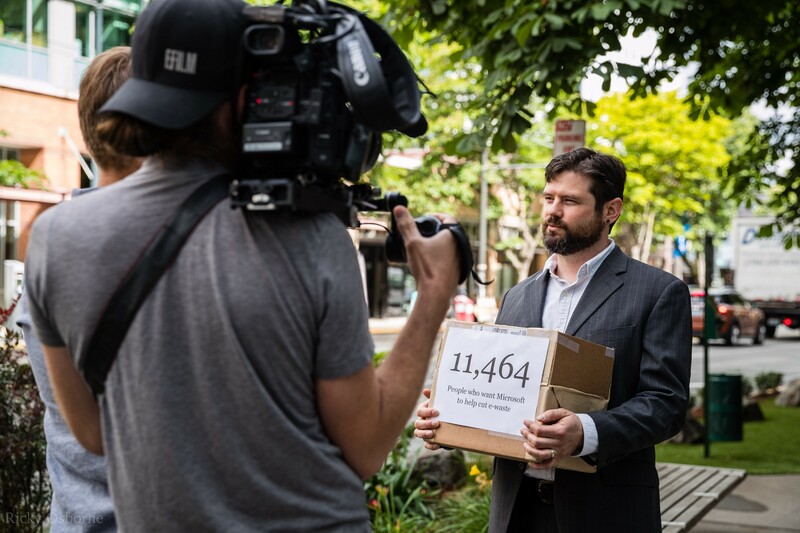 In response, U.S. PIRG delivered more than 11,000 petitions to Microsoft offices, calling for greater accountability for electronic waste disposal and easier access to the tools and information needed to repair products. Want to help us pass Right to Repair? Email your state legislators using our action page.